Drinking in Marrakech Medina is one of the great pleasures of visiting or living here. It runs contrary to accepted wisdom about life in a predominately Muslim society and surprises by the tolerance and openness shown by authorities and local inhabitants alike. In this blog I’ll look at the sale of alcohol in the supermarkets and specialist shops, as well as my favourite Medina hangouts. I’ll also take a brief glance at the local hooch – Mehia. And remember to CLICK HERE if you’re looking to buy a Riad. While there are no supermarkets selling alcohol within the Medina itself, there are a couple of strategically placed shops just outside the walls of the Old City. There are Carrefour and Champion supermarkets with an array of beers, wines and spirits within walking distance of Jemaa El Fna. 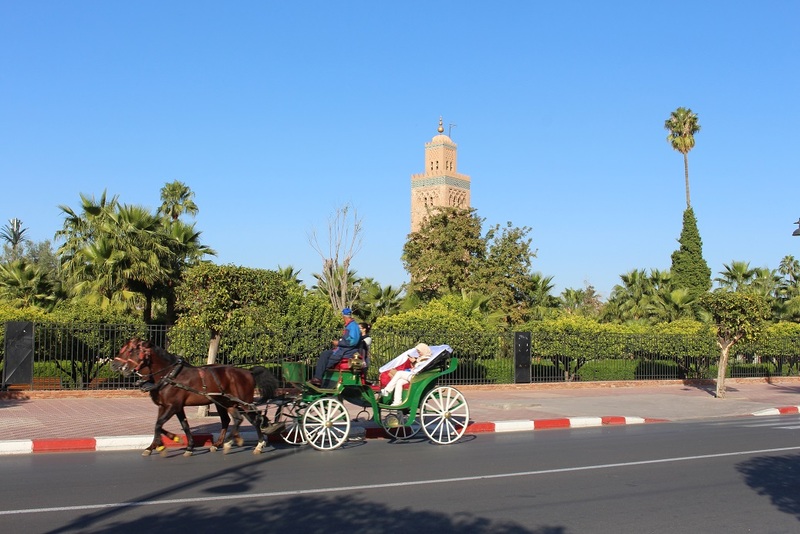 Within a short taxi ride of the Medina you will find two big Carrefours with well stocked Caves – one in the new Menara Mall complex on Avenue Mohammed VI and the other at the Al Mazar Mall near the Agdal Gardens. The Atacadao Hypermarket on the Fez Road (previously known as Metro) is a great place to stock up as they do wholesale rates if you buy in quantity. In Gueliz there are a number of local shops where you can get your drinks – notably on the Avenue Mohammed V and in the Marche Central. During Ramadan, only a few outlets are open and only to non Muslims. You will need to take your passport along if you want to buy alcohol during the Holy month. Within the Medina there are numerous cool places to go for a drink. 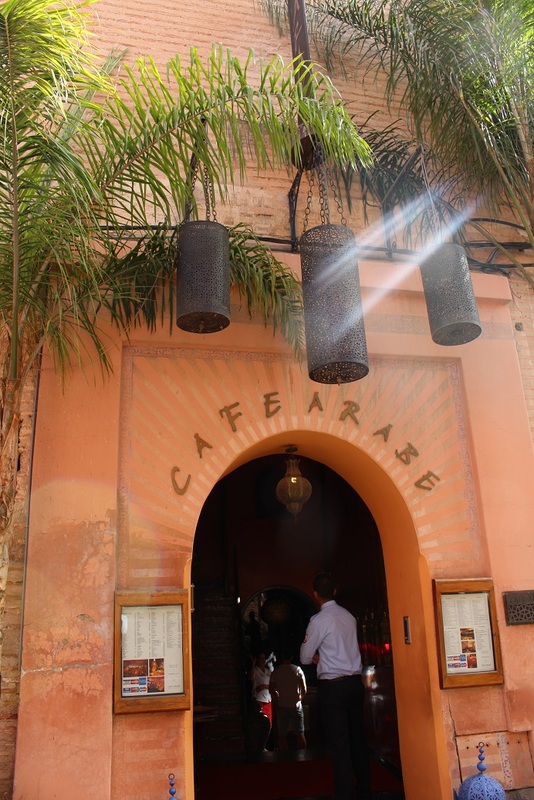 My local is Cafe Arabe in Mouassine, right opposite the Secret Garden. 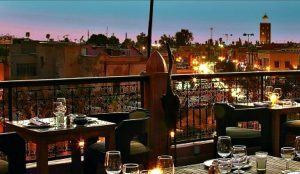 https://www.cafearabe.com/en/ It’s got a great terrace, best experienced at sunset, and the food is OK too. Another great sunset terrace is at KosyBar on the Place des Ferblantiers. http://www.kosybar.com/index_en.htm – I’m not enamoured of the food yet to sip a cold drink as the sun goes down behind the Kotoubia is a real spectacle. 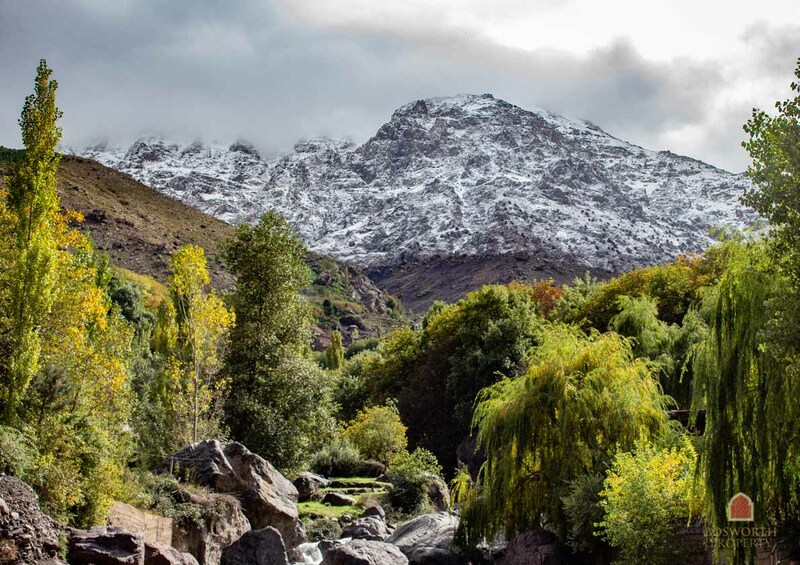 Just 100 yards away is the Tanjia – it too has good views and the occasional belly dancer. Around Jemaa El Fna square are a number of drinking spots. If you go the Marrakchi Restaurant, next to the Cafe de France – be sure to book a window table. There are fabulous views of the Kessabine end of the square. 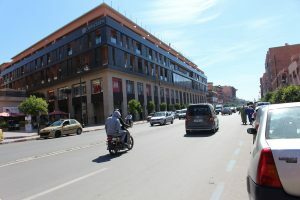 http://www.lemarrakchi.com/ – Just up the Rue des Banques from there is the newly refurbished Salama Restaurant. It’s got decent views and runs a happy hour. It’s run by the same people as the Tanjia. 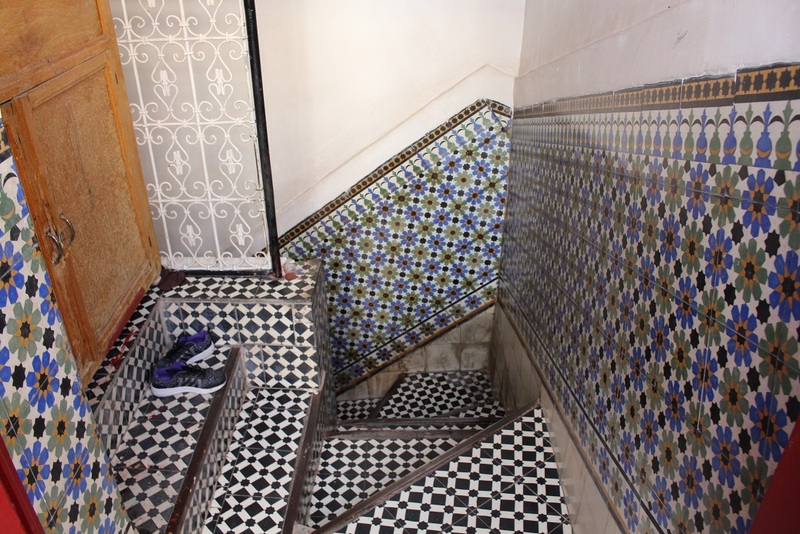 Possibly the oldest drinking spot in the Medina is the Tazi Hotel at the end of the Rue des Princes a couple of hundred yards from Jemaa El Fna. 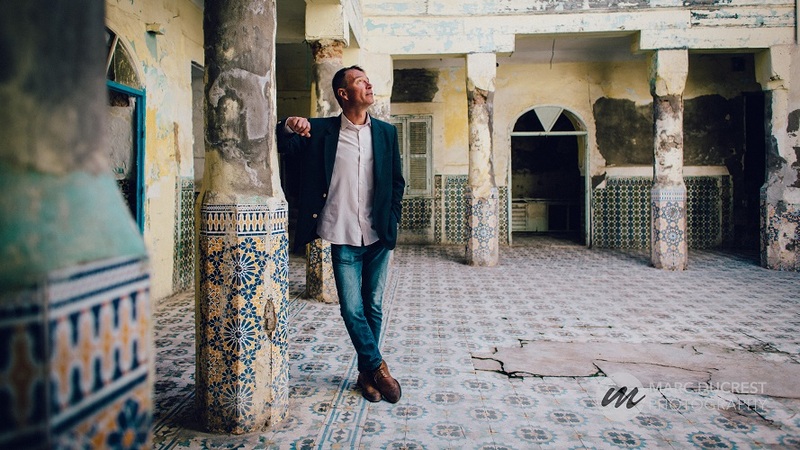 The atmosphere is one of decadent 1950’s Marrakech and the place has seen better days. It’s fun though. I used to enjoy a drink in the Nomad Restaurant and Le Jardin Restaurant. They have recently had their alcohol licences revoked for an as yet undisclosed reason. Hopefully they’ll soon get them back. The Nomad on the Place des Epices has a particularly cool roof terrace and it would be great to be able to drop round for a drink again. While all these, and other, restaurants sell good quality beers, wines and spirits (and the Moroccan wine and beer is surprisingly good), the local hooch known as Mehia (Mahia, Majia) can be a seriously dangerous road to travel. As it is technically illegal it’s production tends to escape normal quality controls. It is best avoided in anything but the smallest quantities. It is usually distilled from dates or figs, although other sugary fruit is sometimes employed. Personally I stay away from it. In conclusion I would say that drinking alcohol in Marrakech Medina is generally a very pleasant experience. 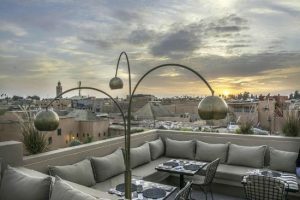 Whether it’s sat on the terrace of your Riad or in one of the numerous restaurants around the Old City, having a cool sundowner away from the hustle and bustle of the streets is a most relaxing pursuit. Try the Casablanca Beer. Have a sip of a great Moroccan red wine. Slurp on a cold Gin and Tonic or a minty Mojito. And enjoy everything that this marvellous city has to offer you. Bosworth Property Marrakech can be reached 24/7 on +212658025028 or by mail [email protected]. You can also use the form below to contact us with any questions you may have about this beautiful city that we call home.